Cherie E. Morganroth is a partner in the Birmingham, Michigan office of Morganroth & Morganroth. She practices in the areas of civil, corporate, and business litigation, alternative dispute resolution, appellate practice, and family law. 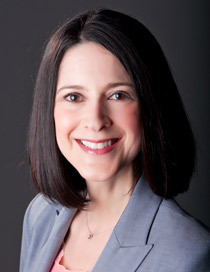 Ms. Morganroth joined the firm in 1992 after graduating from Wayne State Law School. Ms. Morganroth has extensive experience in a wide range of complex commercial litigation involving contractual disputes, business fraud, products liability, and business separations. In addition to complex and general litigation, Ms. Morganroth's practice also includes appellate work and high conflict family law matters. Co-counsel in a jury trial on behalf of a physician in a separation dispute with his partners in a medical practice that resulted in a no cause of action against the partners and a verdict in favor of her client on his counterclaims. Co-counsel in the representation of a catastrophic automobile accident victim resulting in the loss of a leg that resulted in a substantial judgment in favor of her client where the insurance company refused to provide coverage due to the "wrongful conduct rule" since the victim was not licensed to drive at the time of the accident. This case proceeded all the way to the Michigan Supreme Court where the case successfully concluded in favor of her client. Co-counsel in a complex commercial matter against two large national grocery chains that resulted in a breach of contract and fraud judgment in favor of her client in the amount of $31.0 million after a lengthy jury trial. Co-counsel in a products liability case against a major commercial company whose food product involved dangerous packaging resulting in a monetary settlement in favor of an injured victim. Co-counsel in high-conflict divorce and custody cases, including post-judgment appellate level matters resolved successfully in favor of the firm's clients. Co-counsel in a contentious civil lawsuit resulting in dismissal of claims against her client wherein the plaintiff claimed closed head injuries and serious permanent injuries purportedly resulting from a physical altercation between the parties. Co-counsel in approximately 16 years of representation of a successful and high profile local business regarding ongoing business and legal matters and varied litigation including corporate and transactional work, customer disputes, employee matters, competitor disputes, noncompete agreements, business ventures, and numerous other matters. Co-counsel in a hotly disputed fraud and breach of contract case involving claims and counterclaims between former business partners which resulted in a favorable pre-trial settlement for her client. Co-counsel in commercial transactions and litigation regarding a corporate matter involving a highly funded failed business venture with multiple parties and court cases. Ms Morganroth graduated from the University of Michigan in 1989, where she received her B.A. in Psychology. She received her Juris Doctor from Wayne State Law School in 1992. Ms. Morganroth is licensed to practice law in the State of Michigan, in both state and federal courts, as well as the United States Court of Appeals for the Sixth Circuit. Ms. Morganroth is a member of the American Bar Association and the Michigan State Bar.